We aim at giving all our students opportunities to learn and to achieve promoting their social and cultural development and preparing them for future life experiences. English is the means of instruction in our school and the tool to acquire knowledge and skills. Pupils are taught to express themselves correctly, appropriately and accurately both in the oral and the written form. At our school students are imbued in the British culture as a rich and influential set of beliefs. We also recognize English as a vital tool to communicate no matter what walk of life pupils take in the future. Therefore Maths, History, Geography, Nature, Science and English Grammar are taught throughout all Primary. Maths is a crucial part of our curriculum as we understand it as a unique tool to make sense of the world. It is a way of thinking. There are three main strands in our instruction in this area: mental, mechanical and problem work. Problem solving and active learning are the elements that make a difference in our programme of study and make us reach the standards we are proud of. Through the study of the past in British History we stimulate children’s curiosity and understanding of how it influences the present. We promote historical enquiry, development of good memory, ability to give sound explanations and note-taking skills. Geography aims at inspiring curiosity and fascination about the world and its people.Children get to know about how other people and societies live and to think globally about their responsibilities towards the environment. Nature/Science helps interpret the world through the study of the lives of animals, plants and human biology. Early notions of Physics and Astronomy are also included in this area. In English Grammar pupils study and use English language and literature to become better readers, writers, speakers and listeners. The study of the English language itself enables pupils to find patterns and structures that explain how language works and enriches the way of expressing themselves. As from Form II we hold Public Speaking sessions in which children are weekly asked to prepare a topic to present to the rest of their class. By doing so they expand and deepen their cultural background. At the same time they develop their presentation skills and their abilities to speak in front of audiences. To round off their studies in English language, Form VI pupils sit for the University of Cambridge Preliminary English Test (PET). The school enrols pupils in this exam to validate their knowledge and provide them with a first experience in sitting for international exams. Spanish is formally introduced in the curriculum in Form I meeting the objectives and requirements set by the Uruguayan Educational authorities. Our methodology is based on the fact that both English and Spanish support pupils in their learning and complement each other. This implies that each area of knowledge is not taught both in English and in Spanish but that different teaching points are tackled in each language to gain profound insight. Idioma: Since it is formally introduced in Form I Spanish Language is an essential, integral part of the curriculum. The aim is to develop pupils’ skills in oral, reading, writing and listening in their mother tongue as well as raising their spelling awareness and developing their vocabulary. Matemáticas: Based on the fact that Mathematics is a discipline that has a register and terminology of its own it is first introduced in English which is the means of instruction at our school. It is in Form III, when students have become fluent in the fundamentals of Mathematics, that some concepts are dealt with in Spanish to foster conceptual understanding and application of knowledge in their mother tongue. Historia Nacional: The teaching of our national history seeks to provide understanding of Uruguay´s past and to help construct a common national identity. 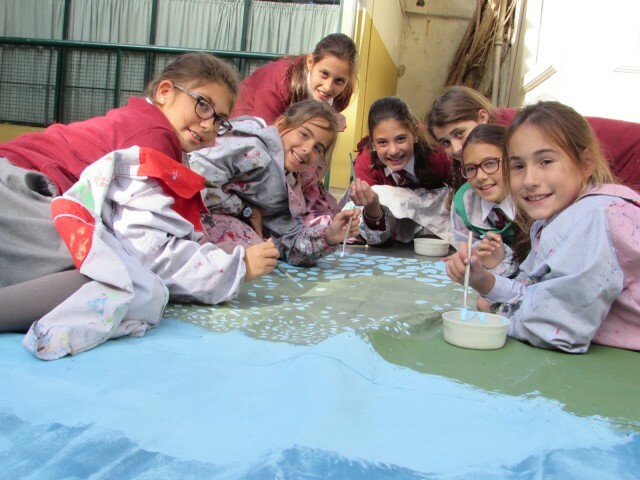 Geografía: It equips pupils with knowledge about our country, its resources and its natural and human environments, together with a deep understanding of our connection to the Americas and the wider world. Ciencias Naturales: It provides the foundations for understanding the world around us. Through different types of science enquiries on everyday situations pupils are guided to draw scientific hypothesis. The Arts are an integral part of our school curriculum. While it is true that creativity permeates the entire school environment it is in the arts where children find an ideal arena to develop it. Art & Crafts, Drama and Singing are the three strands of our program in Arts and from the very first stages all pupils benefit from instruction in these three areas. In Art and Crafts we aim at ensuring that pupils produce creative work, explore their ideas while they brush up on their drawing, painting and crafts techniques. They also get acquainted with the work of great artists and the historical period they belonged to. The Art Contest is the occasion on which pupils have to put all the skills they have learnt in this area at use and give their very best. Every child has a chance to excel in drawing or colouring techniques, arrangement of forms and shapes and creativity . A different artist and topic is chosen each year and all the children from Form I to Form VI take part in it. In Drama qualities such as risk-taking, leadership, and team work are instilled. We believe it promotes self-esteem and a sense of achievement to all pupils regardless of their academic ability. It is about good communication and having fun and at the same it requires discipline and direction. In Music we encourage pupils to feel it as a way of expression that develops their musical abilities . In this area children learn to sing, use their voices and explore different music genres and allow each of them to find more about themselves. The Singing Exhibition and the Musical Play are very much looked forward to events which take place towards the end of each academic year and in which children show everything they have worked on in these areas. In Information Technology we aim at preparing our pupils to be confident, competent and responsible users of technological tools. Technology at St. Andrew’s is a tool for learning and research and at the same time intrinsic to the way of performing in the present days. Therefore, it is used for the teaching of the different subjects as a means to support and consolidate learning. As from Form I each child also gets a weekly lesson on IT where they are taught to use technological tools competently. The school counts with a Laboratory equipped with last generation, networked computers and every classroom has a computer and a projector in it. Besides, there are portable interactive whiteboards at teachers´disposal. 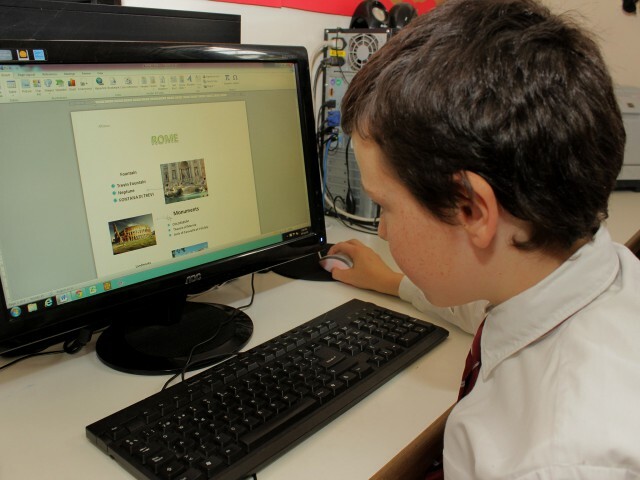 Pupils are taught how to use different kinds of software that enable them to process information and to create drawings and presentations effectively. A key aspect in the technological instruction we provide at our school is how to make a judicious use of Internet and social networking. 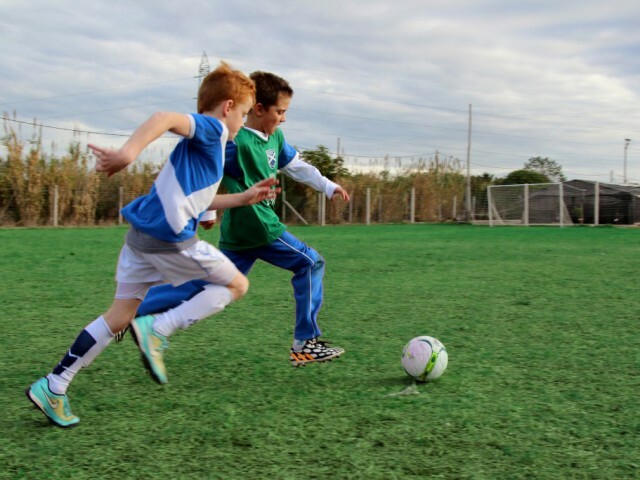 In this area we seek to develop pupils’ physical competence and confidence and to encourage a positive attitude towards healthy and active lifestyles. The year’s big event is Sports Day. All pupils take part in a sporting event where different competitions are held. This is a day on which sport is celebrated and the whole school family is invited. Another highlight of the sporting activity at our school is the Agnes Nery Cup, an interschool rugby and hockey tournament, to which schools from LID are invited to participate. This event is named after the school´s founder and first headmistress. Form VI pupils participate in a Sports Exchange Programme. Early in the year they travel to Buenos Aires and take part in hockey and rugby matches organized by the host school. 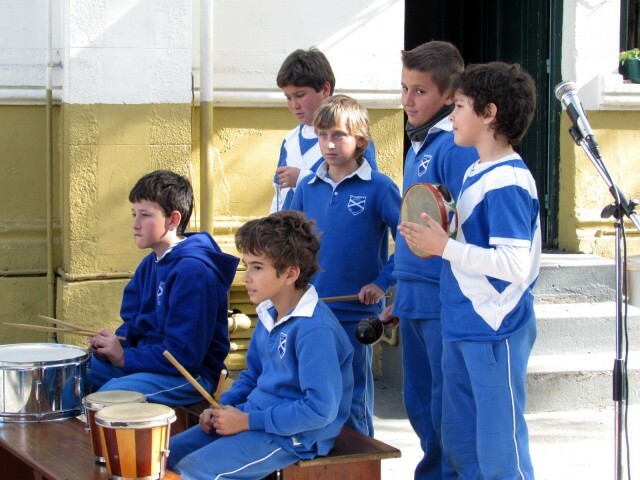 Later on the school from Buenos Aires is received in Montevideo when more sports competitions are held. This activity aims at scaffolding our pupils in gaining further maturity and independence. 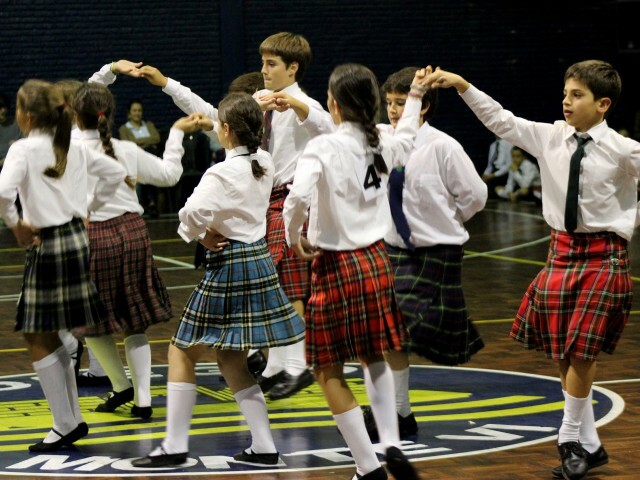 Scottish Dancing is a deep-rooted tradition in St. Andrew´s School for a number of reasons which have to do with the school´s ethos. Through this activity we open a window to the rich Scottish cultural tradition. Every child from Form II to Form VI is offered the opportunity to dance during their primary cycle. We hold a dancing exhibition which is a very much looked forward to event by students, ex-pupils and parents. A high point of this occasion is the eightsome reel danced by the leaving generation and their parents.